As organizations strive to do more with less, DB2 Universal Database v8.1 on Windows Server 2003 brings unprecedented enterprise-class scalability to 32-bit and 64-bit Intel platforms. Supporting both vertical (scale up) and horizontal (scale out) scaling, DB2 UDB v8.1 represents over a decade of industry proven scalability with both non-clustered and clustered database architectures. 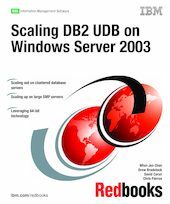 This IBM Redbooks publication is designed as an informative guide to scaling DB2 UDB V8.1 with Windows Server 2003. It is intended for database and system administrators who need both an introduction and detailed information on scaling DB2 UDB on Windows Server 2003. We begin with an overview to scalability including the goals, measurements, and common approaches. We introduce the scalability features of DB2 UDB, Windows Server 2003, and the IBM xSeries Servers followed by some design considerations for scaling. We dedicate an entire chapter to running DB2 UDB on 64-bit Windows including installation, configuration, and 64-bit migration techniques. We discuss scaling up and how to leverage large memory support in a 32-bit environments. Finally, we include a chapter on scaling out including adding logical and physical database partitions.